For courses in Introduction to Comparative Politics Sets the standard for introducing the field of comparative politics This text begins by laying out a proven analytical framework that is accessible for students new to the field. The framework is then consistently implemented in twelve authoritative country cases, not only to introduce students to what politics and governments are like around the world but to also understand the importance of their similarities and differences. 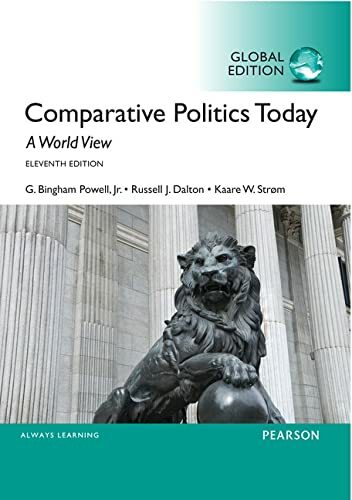 Written by leading comparativists and area study specialists, Comparative Politics Today helps to sort through the world's complexity and to recognize patterns that lead to genuine political insight. MyPoliSciLab is not included. Students, if MyPoliSciLab is a recommended/mandatory component of the course, please ask your instructor for the correct ISBN and course ID. MyPoliSciLab should only be purchased when required by an instructor. Instructors, contact your Pearson representative for more information. MyPoliSciLab is an online homework, tutorial, and assessment product designed to personalize learning and improve results. With a wide range of interactive, engaging, and assignable activities, students are encouraged to actively learn and retain tough course concepts.